Davao City in the Philippines is surrounded by tropical islands that can be reached by ferry or by “pumpboat” – within mere minutes, you can be transported from downtown Davao to a secluded tropical beach, all set for a round of nature & adventure travel activities. The resorts listed here are all located on one of those nearby islands. For Davao’s biggest holiday (and a good excuse to go to Davao), read our article about the Kadayawan Festival. This 14-hectare beach resort on Samal Island used to be an actual pearl farm, but has since been reorganized into the comfortable-bordering-on-posh resort it is today. Visitors alight from the Davao ferry onto the umbrella-like "parola" structure on the dock (which also doubles as a beach bar at night; the sunset view from here cannot be beat). From the parola, the resort's 73 guestrooms can easily be reached on foot. The most desirable accommodations are laid out along the shore, beach houses on stilts called "Samal houses" that offer untrammeled views of the sea. A pristine (though small) white-sand beach sits in front of the property, alongside a gorgeous round infinity-edge pool within view of the parola. Adventurers can ride speedboats from the resort to choice diving spots near the resort. One of the newest resorts on Samal Island, Club Samal Resorts happens to be its most Instagrammable. Its centerpiece – a massive swimming pool – brings out kids and teens, who hop onto their ample supply of fun-looking floaties for play and selfie purposes. The resort facilities ensure that you stay in a cozy bubble throughout your stay. All of the air-conditioned rooms in the resort face the pool area, and a restaurant on the second floor serves a generous menu of Western and Filipino dishes (which may be a tad overpriced, but reasonable considering that groceries are shipped in daily from across the strait). The resort’s sliver of beachfront offers a little white sand for kids to play on, with snorkeling accessories and paddleboats readily available for rent. 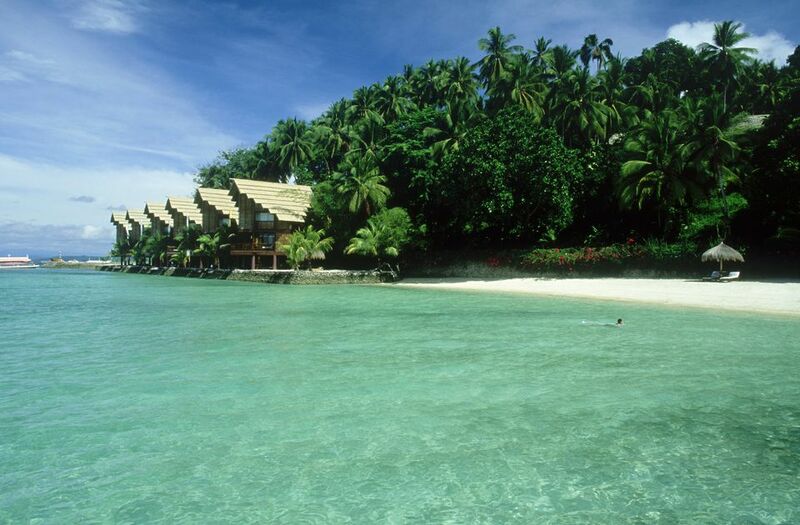 Paradise Island is one of the very first beach resorts on Samal Island, and it's kept its game up over the years. The bustling 800-yard-long beachfront is chock-a-block with picnic tables and Davao residents ordering grilled goodies from the kitchen while their kids play at the white-sand beach before them. (An unattractive awning has the effect of making the beach look crowded, but arguably cuts down on picnicker discomfort.) Lifeguards survey the waters constantly, making Paradise Island one of the few lifeguard-guaranteed beaches in Davao. As far as accommodations go, the beds in Paradise Island range from budget-simple to three-star comfy: from basic dorms to rooms with private verandahs overlooking the resort's verdant lawns. Bali-Bali isn’t an attempted clone of the island of Bali (the name actually comes the word “beautiful” in a local dialect), but is its own thing: a semi-private villa resort designed along Asian lines, featuring six villas arranged alongside a long swimming pool. The resort’s main draw is its privacy, as no walk-ins are allowed. All stays include three meals (breakfast, lunch, and dinner) and access to all amenities except for the water sports facilities (those are charged separately). Adventure-seeking guests can engage the resort’s diving, snorkeling, kayaking, and speedboat cruise amenities, or just chill out by the infinity-edge pool overlooking the sea if that’s their thing. The island of Talicud offers a little more privacy than nearby Samal, and Leticia by the Sea has perfected the "private island" concept on Talicud's shores. The posh little resort is organized around a pavilion on a hill that offers wraparound views of Talicud and the surrounding sea. An artfully-manicured garden separates the pavilion from the air-conditioned cottages and villas that make up the resort's accommodations. The resort is priced to favor large groups; Leticia by the Sea is a favorite for weddings, group retreats, and company outings. Guests get to enjoy the resort's ample watersports facilities, from jetski rides to snorkeling to pedal boats to diving (the owner is an avid diver and underwater photographer). Bluejaz Resort is a kid-friendly destination in Samal known for its waterslides; its kids' water play area features three short slides, while the grownups get two high-speed slides to themselves. The resort's private beach is good for a number of watersports, too - guests can try their hand at waterskiing, wakeboarding, and diving, using the resort's own facilities. For guests staying overnight, the resort's "Fiji-style" cabins fill in for travelers on a budget, while guests with money to spare can book the "ambassador" room, an air-conditioned villa directly overlooking the sea. Privacy is Chema's best attribute, as an intimate resort with a garden set apart from the beach. The resort's three cottages and restaurant pavilion stand around the garden. All accommodations are fully air-conditioned and possess verandahs, spacious bathrooms en suite and LED TVs (no cable or satellite access, sadly). As you walk closer to the sea, you'll find Chema's saltwater swimming pool adjoining the bar, with stone steps leading down to the small beachfront. Aqua sports and spa services available upon request, subject to availability. A rustic, secluded resort that makes the most out of the hilly terrain facing the sea: Hof Gorei provides a variety of cottages within its property, ranging from beachfront cottages a few steps away from the resort’s private white-sand beach, to hilltop chalets abutting the forest surrounding the resort. Accommodations are air-conditioned, and come with bathroom en suite and cable television. Guests at the hilltop get a good chance of interacting with the resort’s semi-wild hornbills, which roam the property looking for tidbits from visitors. Precious Garden was built by a German expat in Davao, and the Mediterranean/European influence shows in the cozy restaurant with an ample wine list, the garden out front, and the large-bosomed sculpture (!) facing the entrance gate. Guests can choose from ten streamlined but cozy guestrooms; the second-storey rooms look out to the garden. The beach is set apart from the property; you'll have to walk about five minutes to get to the sea, where a jetty and bar sit out over the water. The resort's main strength has to be its food - the pizza, German sausage, and kinilaw are all particular favorites for guests. The resort's owners bought the property from the island's mayor, then transformed the place into a rustically homey resort, set at a remove from the Samal tourist crowds. A total of 14 guestrooms are up for grabs: hot and cold running water, cable TV, and free WiFi are all part of the deal. The management is very flexible: you can bring your own food and have the staff cook it for you, or you can hire the resort's own motorized boat to explore the islands around Davao Gulf.